14 October 2016, 17:05 p.m.
TomTom believes it has something to offer the developing wearable market and has launched its own fitness band in the form of the TomTom Touch. In a market being flooded with fitness devices you need to offer something new – in TomTom's case they've added a body composition feature. On the rear you will find two sensors – one for standard heart rate tracking and the other a circular metal pad used for painlessly sending the electrical current around your body used for detecting your body composition. I'm glad I took my readings now because in a few weeks I would expect to be told I'm 80 percent tomato soup. The front is adorned with a vertical black and white touch screen along with a button underneath which activates the display and doubles as the other touch point for body composition analysis. We're a fan of this setup which has kept things simple yet functional. In order for the sensors to gather accurate measurements the band must ensure a secure fit without being uncomfortable to wear for long periods of time, and TomTom has achieved this better than most other fitness trackers we've tested. Once the display is activated we've found it switches back off far too fast which on most occasions we found to not give us enough time for reading information or interacting with it. Considering the small design of the TomTom Touch we presume this is a requirement to help the battery meet its five-day life, but we'd like to see it extended in a firmware update. The display itself can also suffer from poor responsiveness which combined with the aforementioned issue with the display switching off prematurely can lead to a lot of frustration. In the middle of a workout you want a device which isn't fiddly to use, and unfortunately this is. Given the size of the display it's understandable not too much information can be shown on it, but we can't help but feel more should be available without connecting to its app. Each section has an image to indicate what it represents and those of us who are used to fitness trackers can work it out, but for beginners, it's perhaps not as intuitive as it should be. From the main display, which shows the current time, you can swipe up or down to navigate the interface. 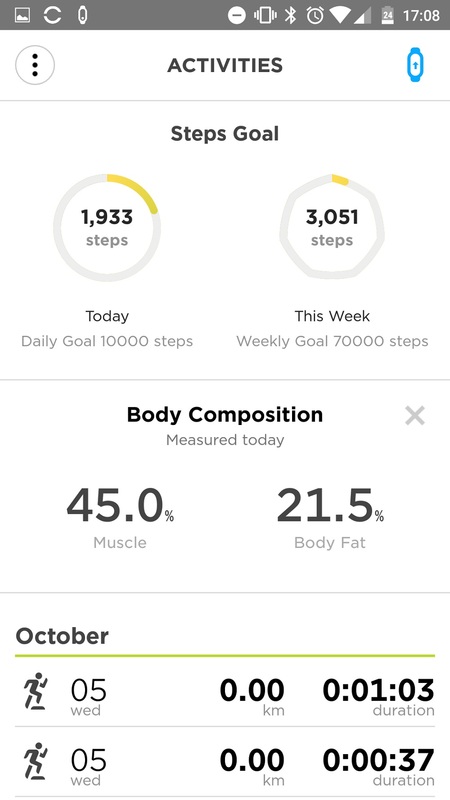 TomTom has cleverly divided this into two areas – swiping up will give you current stats like calories burnt and distance travelled, while swiping down will lead you to interactive features such as starting a new activity, checking heart rate, or using the stand-out feature of analysing your body composition. Analysing body composition on the TomTom Touch is a first on a fitness tracker and makes a nice addition in a sea of 'me too' wearables. Unfortunately, we're disappointed in how the feature has been implemented. When in the correction area of the interface, holding your index finger over the metal pad on the front of the device will begin analysis of your body composition and then provide a tick or a cross to indicate whether it was successful or failed. This is where the biggest example of the lack of information on the display comes into effect as you can't see the results on the screen and you must sync it with your phone to see the results. The experience once again goes from something which should be easy and seamless into something frustrating. At most gyms, or at home, you can hop on a modern scale and have a body composition analysis performed within seconds. If this could be performed on your wrist as we expected with the TomTom Touch it would be fantastic, but forcing you to pair with your smartphone kills the experience. Do you even app, bro? Our review sample was provided in a new condition like you would find in retail, which is commendable as it allows us to report – good and bad – how you will find the experience out the box. Too often devices have been updated with the latest firmware before they're sent which can lead to end users running into bugs and issues which reviewers did not. The pairing experience was a little troublesome and took us a few tries for it to work and on the Android device we tested it with. The software also requested we go through a process of accepting pairing through our notification centre which felt like a bit of a loophole. A few days after we received the device an update was posted to TomTom's accompanying MySports app which claimed to fix these issues – after resetting everything to factory defaults and going through setup again, it appears to have worked. Our biggest issue with the app experience is that – although the app will alert you to updated firmware available – you can't update the device through TomTom's mobile app. Instead, you have to connect it to desktop software. In a world of mobile, there are many people who could find it difficult to get the latest firmware updates and the important fixes they provide. We can't help but feel this is some desktop-first legacy thinking from TomTom who are used to providing sat nav firmware in the same way. Interestingly, I've recently invested in an Edge cycle computer from TomTom's rival Garmin and it also wants to update firmware on desktop. I can't imagine modern companies such as Fitbit, Jawbone, and Moov forcing users to update firmware using a desktop app. The mobile app experience also leaves a lot to be desired. We had some issues with syncing before the update and wrote in our review notes to mention the endless spinning loading circle which provided no indication of how long was left – but since the aforementioned update a loading bar is now available so it's eliminated one key complaint and shows TomTom are improving their experience. On the main screen you'll find a dashboard which shows progress towards any set goals as well as body composition and the usual suspects including step count. All the sections in the app seem to load quite slow and feels like the result of some unoptimised web code to help with cross-platform development. The most notable omission – which has some irony considering TomTom's legacy – is that maps of your routes are not provided even when the band was connected to your smartphone. 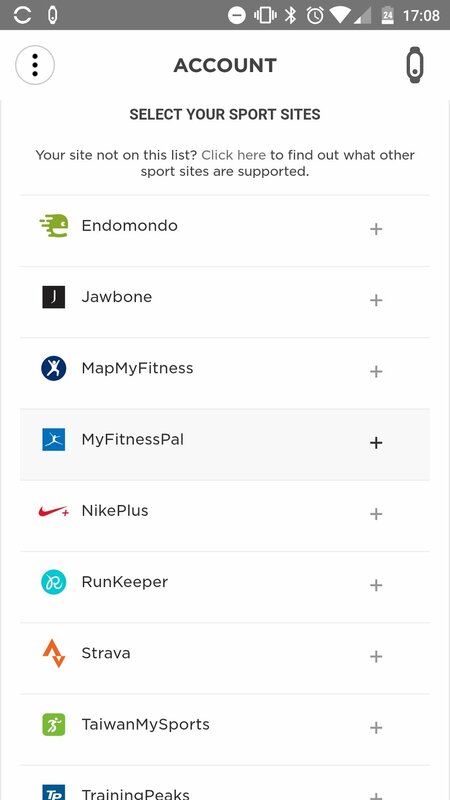 What's impressive, however, is the amount of third-party services which TomTom supports that far surpasses other fitness trackers who often push their own ecosystems or those who have exchanged some cash behind-the-scenes. We commend TomTom for bringing a useful new sensor to market, but the usability of the current TomTom Touch we feel lets it down. More work needs to be done on the reliability of interacting with the device, the information shown on the band, and improve the speed and features of the app. A lot of these issues can be rectified using firmware and app updates so we'll keep you updated if these become available. As it stands, we welcome TomTom to the fitness space and the innovation they can bring, although we're not left impressed with their Touch wearable. What are your thoughts on the TomTom Touch? Let us know in the comments.